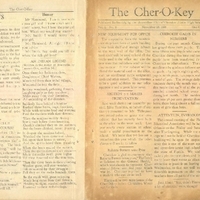 The Cher-O-Key, the bimonthly school newspaper published by the Journalism Club of Cherokee Junior High School, which was located at 550 South Eola Drive in Orlando, Florida when it opened in 1927.. The Volume I, Number 2 edition was published on November 23, 1928 and cost one cent. Articles in the newspaper include new equipment for the school's office, a class presentation, Roberta Barnett's essay "The Teeth in Relation to the General Health", new students to Cherokee Junior High, the annual meeting of the Florida Educational Association, the Thanksgiving holiday, students cited for scholarship, a calendar of events, the French Conversation Club, Jack Kline's birthday party, personal updates for students and teachers, Memorial High School's presentation of "The Family Physician", sports games and tournaments, a Journalism Club study of how to write news, and a Native American legend. Original school newspaper, written by Ruth Wetherington, ed. The Cher-O-Key Vol. I No. 2. November 23, 1928: Private Collection of Thomas Cook. Digital reproduction of original school newspaper by Ruth Wetherington, ed: The Cher-O-Key Vol. I No. 2. November 23, 1928. Published Bi131-Monthly by the Journalism Club of Cherokee Junior High School. The carpenters from the mainten¬ance shop hsve been at work building a new book shelf and storage cabinet on the west wail of the office. The book shelf will be used to hold alhavee hooks used in the office and also the new ones that publishers send uswallm time to time. In the cabinet will be placed the material used in the office, such as enrollment cards, assignment cards and other record. This promises to be a good addition to our office equipment and a great labor saver. Last week during our assembly pe-riod, Edna Yacobian, in behalf of sec-tion 7.7 presented to Mr. Thompson two p7-7ed palms to grace the new cabinet that has recently been built in the office on the west wall. L7-7 year nearly every section in school made a useful presentation to the school. We hope that 7.7 has set a preced ent this year which the other classes will see fit to follow. Cheschool-s glad to anno7-7e that Roberta Barnett 's essay on,"TheTeech in Relation to the General Health," which was chosen to represent Cher¬okee at Miami won first prize which was $5. Cherokon,"TheTeethto have a student who can do so well. There will be two more issues of the Cher-O-Key brine Cilistmas. Watch out for them. During the past month Cherokee has gained three more pupils. There were fifteChristmas-ils who came to Cherokee during this time and twelve pupils have been transferred from Cherokee to other schools. The tfifteChristmas-ils grades as follows: seven¬th grade, 184 pupils; eighth grade, 164 pupils; ninth grade, 142 pupils, making a total cf 490. The average daily at¬tendance during the month was 450; this means that 94% of all the pupils enrolled attended school every day during last month. The number of girls was 3o per cent greater than the boys; there being almost a full section more of girls than boys. The annual meeting of the Florida Educatioal Association will be held in Orlando on the Friday and Saturday after Thanksgiving. While the meet¬ings will not be held in Cherokee, the building will be open for inspection, since this is one of the most modern and up-to-date junior high schools in the state of Florida. We wish to make a plea to the students and teach¬ers to leave their rooms as clean and attractive as possible on leaving next Wednesday, so that we will make a favorable impression on the visiting teachers from all parts of the state. Jack Kline; "Say, didn't Hoover get a lotlo,: of electrical volts, though? On Wednesday, Nov. z8, school will be dismissed at 3:00 o'clock, which marks the beginning of our annual Thanksgiving holiday. There will be no school Friday. Sammie Bethea was dismissed from the Orange General Hospital Sunday, following an operation for apendicitis His Cherokee friends are glad to know of his improved condition. Wilson Hopper has moved to Palatka. Wednesday, Nov, 28— Thanksgiving prcgram with special music. Nov. 3o and Dec. 1-Florida Education Association meeting in City Audito¬rium and Memorial building. Wednesday, Dec. 5--program sponsor-ed by section 7-5. "Goodness, I, have to take all of my books home this afternoon." "So do I, that horrid Bobby Jones who sits right behind me insisted on tapping lightly on his desk all during study period, and it worried me so that I could not get my mind on my work. "I did succeed in getting my math during study period today but as I was going through the corridors someone bumped against me so hard, that I drop ped my paper. Before I could pick it up, it had been trampled on by a dozen people." "Such people who always interfere with the right of others are not generally liked, are they?" No, nobody admires them or even thinks them smart. they only get themselves in had with the entire school. were these students talking about you? have never seen! You see, it was giv¬en to him by Student Council, and that organization has a way of doing things to perfection. So, of course, Jack Kline's birthday could not be passed by lightly. He was successfully trans-ported to Olivia Park under the camo¬flage of a weiner roast. Imagine Jack's surprise when he found out `twas all for him. Imagine his eyes growing round with wonder when a big brown frosted birthday cake was brought forth. But the wonder grew when he tried to cut the cake, for somehow it prooved too much of a struggle for Jack's delicate physique. After tug¬ging determinedly for a while, Jack grew snspicious. He scraped off the luscious looking icing and found—a wooden cake! Then, 'tis said, that Howard Davis made a grab for some of the icing, and discovered it was soap suds flavored with chocolate. After a good laugh at the joke, the Council brough forth a real birthday cake, and Jack's birthday was celedrated in an honest-to-goodnese way. The second hand book store has disposed of 58 books which have brought about $49.00. Many of the students and members of the faculty took advantage of the vacation presented on Armistice Day and visited friends and relatives in the neighboring cities. Miss Mitchell, Miss Tate and Miss Graham visited Tampa and Miami. Burnett Bartlett went to Sanford. Margaret Harney spent the week-end in Titusville. Miss Ford and her mother visited relatives in Eustis. Connie Taylor visited friends in Jacksonville. Ethel Sligh spent the week-end at Lakeland. Leslie Harding spent the week-end at Lake Apopka. Hoyd Starling acted as mascot with the football team to Sanford, Saturday, Nov. io. Lucille Neal visited friends at Mt. Plymouth. Cora Lee made a trip to Lakeland. Three hundred copies of the Cher-O-Key were sold last time. This is a good beginning, but we believe we should have the support of the entire school. Will you do your part? Mr. Glover and Mrs Campbell, of M emorial were visitors at our audit-orium exercises on November 17. The seven-Monthlymes to date have resulted thus: 7.3 defeat 7.2 and ire now advaned to semi-finals; 7.1 de¬feated 7.4 and are also advanced. The8.2 grade has been the most interesting of all. 9-I defeated 9.2 iu a close game. 9-3-a defeated 9-3-b by forfeit. The same is true of 9-6-a who defeated 9-6-b. JOUNALISM CLUB BEGINS STUDY COURSE9-2st week the Journalism Club in¬stituted a forfeit-urse in connection with the practical experience thaf is received in news writing. The hook "News and News Writing," will be used as a basis for study, a chapter be¬ing considered at each weekly meeting of the club. LaSt week Bob Williams led the discussion "What is News?" Miss Broadbent. Explain yourself." BobbieL1olibi•r. ''Oe drop will kill." Mr' Hammopoison-m in substance-- poor girl and I know a rich one I could marry, but yourself-" ich Onee world you marry? Mr. Smith: I wculd merry the ! poor girl. Mr. Hammond. All right. I'll take your advice. Mr. Smith. Say, could you tell me where the rich girl lives? AN INDIAN LEGEND (Written Mr-the meter of Hiawatha by Lawson Cox, sectionMr-5.) Once three fair Indian maidens, Daughters of Chief Watosa, Wandered from their tribal village, Wandered far into the fores:. So 7-5-)wandered, gathering flowers, Laughing gaily as they wandered, Miles away from their dominion, All unheeding of the disforest. Suddenly from behind a boulder Rushed three hears, huge. ferocious, While with screams loud and piercing Fled the maidens with their flowers. Then the maidens swiftly fleeing Saw a rock before them towering. Quickly climbed they to its summit; But the bears climbed, never pausing. When the bears neared the summit, Then the spirits showed t•wir power—Made the rocks swell, grow hher Till they towered o'er the tree tops. So the maids with great rejoicing Made long ropes from their flowers. Holding to them, reached earth safely, Hastened to their tribal village. “Cher-O-Key (November 23, 1928).” RICHES of Central Florida accessed April 23, 2019, https://richesmi.cah.ucf.edu/omeka/items/show/979.